An iconic event deserves an iconic home – and at the Waltzing Matilda Centre in Winton, creativity, history, purpose and technology have combined to create just that. The new centre, opened in April, replaced the much-loved original building which was destroyed by fire on June 18, 2015. 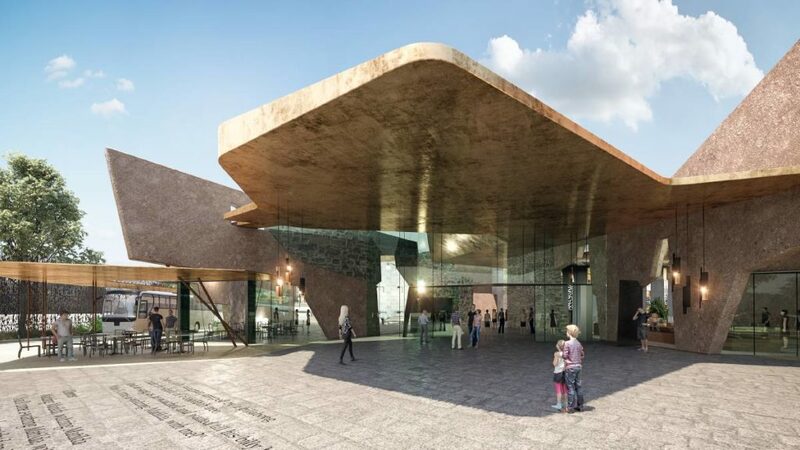 Designed by award-winning architects Cox Architects, work on the new centre began on April 26, 2017 and was completed just shy of a year for the official opening and Way Out West Fest held from April 19-22 this year. For Gabrielli Construction, a Townsville-based building firm, turning the architects’ and draftspeople’s vision into a reality meant finding answers to interesting challenges. The building literally doesn’t have a straight wall – even the tops of the walls are undulating. To create such a building using more traditional methods would have required a full-time surveyor on-site, according to Gabrielli’s construction manager Bernie Travers. Instead, the company turned to BuildingPoint Australia for a future-forward solution. “It took some time for the final solution to our needs to be decided,” Bernie said. “In retrospect this was because the BuildingPoint guys were being really thorough and as this was all new to us, it took a while for us to understand what could be achieved and how. 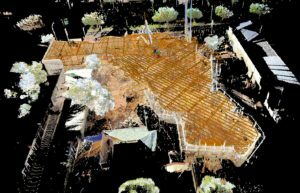 “We acquired a Faro X330 laser scanner using Trimble RealWorks software and a Trimble RTS773 with a Trimble Field Link tablet. The Gabrielli Construction team employed the new technology throughout the year-long build, from scans of the site to the final fit-out of joinery works, finishes, etc. Bernie estimates the adoption of the technology on this job resulted in a massive 25% saving in time – about 3 months – as well as a similar saving in costs, totalling in the vicinity of $3 million. Because we had highly accurate scans to give to suppliers, everything fit first time. For example, we saved around $1m on the glazing thanks to that accuracy,” he said. For a project in as remote a location as this one – Winton is 1355 km from Brisbane and almost 600 km from Townsville – any reduction in travel is a huge boon, not only for getting materials and personnel there, but also in the well-being of the team. “To do virtually everything right first time, to eliminate costly and time-consuming do-overs, is a great advantage,” Bernie said. “As well, we used our cloud point scans as a record of the work as it progressed, giving us accurate and timely snapshots of the project along the way. The team from Gabrielli Construction working on the project received on-site training from BuildingPoint personnel to get them up and running and were quick to respond to any issues, Bernie said. “Our experience with BuildingPoint Australia was second-to-none,” he said. “They moved heaven and earth to get us up and going with the technology and the on-site training was just what was needed. “Of course, the technology is only as good as you are, and the BuildingPoint guys were easily accessible to solve any problems we had which, to be fair, were 99% of the time down to the operator. Bernie says he sees a lot more technology, especially total stations, in Gabrielle Construction’s future. “I am certain this technology will rapidly become the standard for our industry and clients will demand nothing less,” he said. “We are now able to tender for more complex projects than previously because of the technology and that means growth for us. “Its role in providing quality assurance on jobs will become the norm as well as its ability to create a record of time. Contact BuildingPoint Australia to learn how we can help future-proof your company.